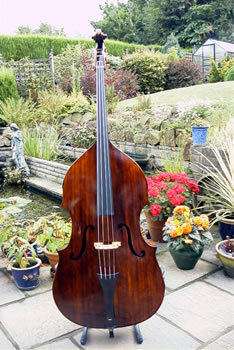 This page will be updated on a regular basis, showing and describing the double basses that we have in stock. 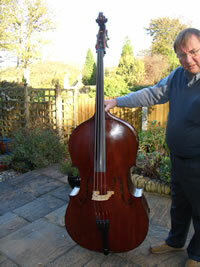 We always have many instruments in stock, but it is worth looking at this page on a very regular basis if you are interested in obtaining a fine bass, as instruments move very quickly. Why not telephone us or make contact to see what is in, or might be coming soon. Don't forget that we will arrange for hospitality if you are coming from another Country, and of course we will always meet you at airports or the local railway station. 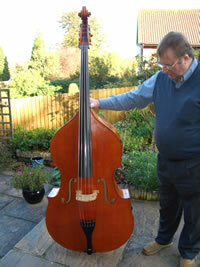 You will nearly always find Italian, English, French, German and other double basses at "Gallery Strings", and we can honestly state that we cater for Orchestral, Solo, Jazz and Rock-A-Billy musicians. From amateur to professional, we will give our best. Nicolaus Testore . The youngest son of Paulo, who lived and worked in Venice from 1755-1765. 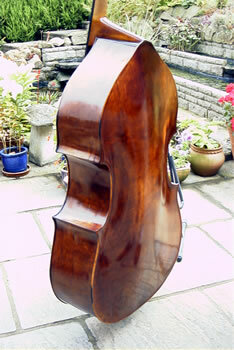 A wonderful maker, who used fine wood. 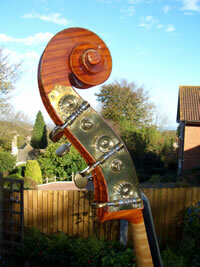 This particular instrument is a swell backed bass. having very fine grained wood. 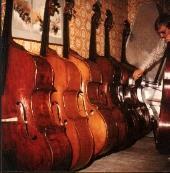 The sound is a truly great solo come orchestral sound, which works in every department. It has, as can been seen in the photgraphs quite high arching, but is easy for a player to get around. 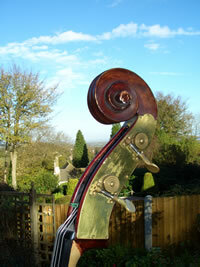 The varnish is a golden brown colour and is beautifully layered. 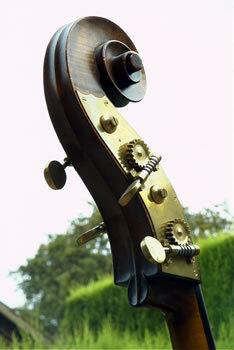 A very fine instrument by a great maker. Hawkes-Riviere. Mirecourt c1890. 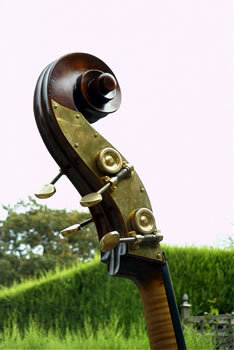 Though this instrument is strictly French in make, I have placed it under English instruments as it was made entirely for the British market, in fact mainly for the British army. 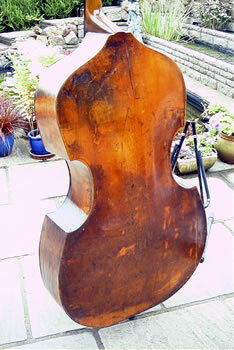 It looks very French, but the sound is English, being large round and even. 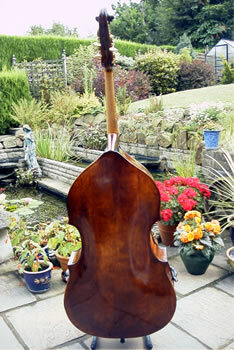 A fine orchestral bass. Ronald Prentice . Taunton 1982. 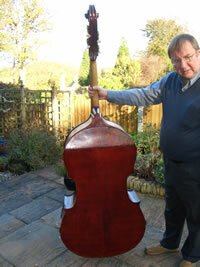 We don't usually sell modern instruments, but this one is worth the trouble. 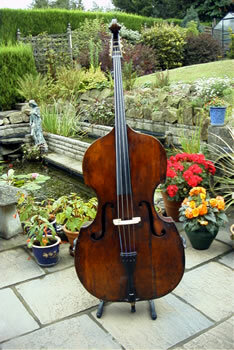 It is a very fine sounding orchestral five stringer made by the Somerset maker Ronald Prentice. In fact this is the very best modern five stringer I have ever come across and well worth a thought by a player that might be thinking of that extra string. The price is also very reasonable, which yet again makes it a very interesting proposition. Joseph Hill. Was born in 1715, he died in 1784.He was an apprentice along with two other great English makers, Benjamin Banks and Peter Wamsley. But after finishing his apprentaship he started a workshop in the Haymarket, London. 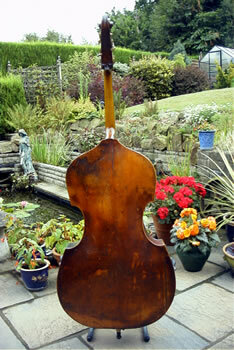 His double basses were probably made with the help of his four sons, all instrument makers. 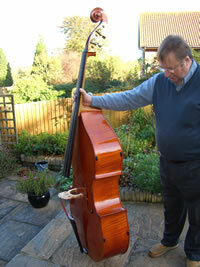 They are fine robust clean bright sounding instruments, good enough for any style of playing. 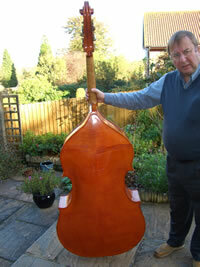 This bass, as you can see is a swell backed viol shaped instrument. The set-up is very good and it sound terrific. Everything is original and was probably made in c1765 period. 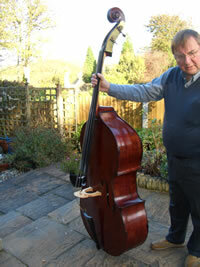 Well worth the trouble of coming to visit and trying this fine double bass.